The Control Panel is a great way to get access to music controls and basic iPad settings from anywhere on the iPad, including when playing a game, browsing Facebook, or surfing the web. You can even open the iPad's Control Panel from the lock screen, which is great if you want to turn down the volume or skip a song. The control panel has been a bit of a puzzle for Apple, and if you are having a hard time finding it, you aren't alone. The control panel has moved around a bit in the last few updates. In iOS 12, the latest version of the iPad's operating system, you an open the control panel by tapping the top-right corner of the iPad display where the battery meter and Wi-Fi icon exist in the status bar. With your finger still pressed against the screen, slide it down toward the middle and the control panel will be revealed. Remember, your finger must start at or near the battery percentage in the status bar. In iOS 11, the control panel existed alongside the multitasking screen. You could open by double-clicking the Home Button or sliding your finger up from the very bottom edge of the display. In previous versions of iOS, you opened the control panel by sliding your finger up from the bottom edge of the display. Double-clicking the home button only opened a version of the multitasking screen that didn't include the control panel. The control panel allows you quick access to various settings like Airplane Mode and music controls. A hidden feature of the control panel is how many of the sections will expand if you hold your finger down on them. For example, the first section that includes Airplane Mode will pop out and show you additional information about each button within it. This is great for getting at even more controls in the control panel. Airplane Mode — This switch shuts off all communication on the iPad, including Wi-Fi and the data connection. So-called because of the frequent requests to shut down communication when lifting off and landing on an airplane, it's not quite as useful as the same mode is on a phone. AirDrop Settings — AirDrop is an awesome (if fairly unknown) feature that allows you to quickly share photos and websites among other content with someone who is in the same room. You can access the sharing features via the iPad's Share button. In the control panel, you can turn AirDrop off, set it to receive content from contacts only or turn it on for everyone. Wi-Fi — If you have an iPad with a 4G data connection, it can sometimes be aggravating to receive a very poor Wi-Fi signal when your data connection would be much faster. This easy access to turn off Wi-Fi saves you from hunting through your iPad settings. Bluetooth — Bluetooth is the type of service you frequently want to turn on and off. It's great to see Apple recognize this and give us a shortcut. Music Controls — These controls are fairly straightforward with your standard play, pause, and skip buttons. 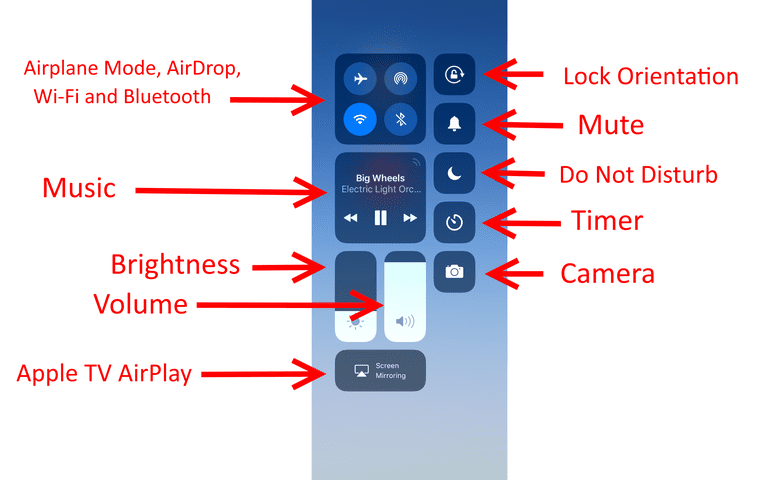 If you hold your finger down on the music controls, the enlarged window will allow you to skip to a certain point in the current song, adjust the volume, share the music to Apple TV, or open the Music app. Brightness — Adjusting brightness is a great way to save battery life, but sometimes it can be adjusted too low to comfortably read. Volume — The quickest way to adjust volume on your iPad is to use the physical volume buttons along the edge of the iPad, but if your hands are busy manipulating the iPad, it can be easy to double-click the Home Button and adjust the volume here. AirPlay — Apple's AirPlay feature allows you to send audio and video to an AirPlay-enabled device. This is commonly used in conjunction with Apple TV to send video from apps like Netflix or Hulu to your TV. It also has the ability to mirror your entire iPad screen. You can turn on screen mirroring with this control. Lock Orientation — The iPad's ability to automatically orient itself is great unless you are holding it at just the right angle where it wants to flip orientation when you don't want the change. This button will solve that dilemma. Mute — Need to kill the sound on your iPad fast? The mute button will do the trick. Just be sure to unmute it when you are done. Adjusting the volume with the buttons along the side of the iPad does not turn off silent mode, which can be confusing at a later date if you are wondering why your iPad isn't making a sound. Usually, simply turning the volume down is a better way of keeping your iPad quiet. Do Not Disturb — Another feature more useful for phones, the Do Not Disturb can still be handy if you receive a lot of Facetime calls. Timer/Clock — Have you ever wanted quick access to a timer or stopwatch? This button opens the Clock app to the timer page. Camera — If you sometimes fumble trying to remember where you moved the Camera icon on your home screen, you now have quick access to it on the Control Panel. And if you want to take a selfie, hold your finger down on the camera button until it expands into a window. This window gives you quick access to take a selfie (which activates the front-facing camera) as well as taking video or recording slow motion video. Notes — Need to get at your notes quickly? The button with a box and a pencil represents the Notes app. How Do You Change the iPad's Side Switch Behavior?